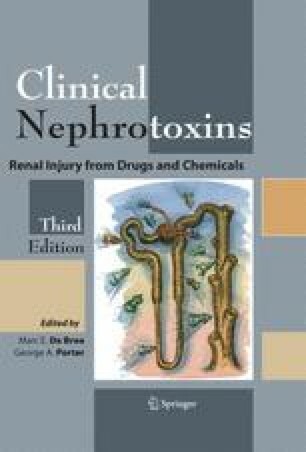 Toxin-induced acute kidney injury (AKI) is a common cause of morbidity and mortality in Africa. However reports in the medical literature are limited because in the majority of cases, identification of the precise toxin is missing . A majority of the toxin induced acute kidney injury in South Africa follows a visit to the traditional diviner (the “ sangoma”). This often results in a conspiracy of silence; the patients are reluctant to admit such a visit and in most instances deny both the consultation, and subsequent ingestion of prescribed herbal therapy . This handicaps the planning of management, particularly as some toxins have multi-system effects, e.g. acute kidney injury accompanied by hepatitis and colitis, as occurs in dichromate poisoning . While the majority of patients admitted with poisoning have been prescribed by traditional healers, approximately 12% of the patients have obtained their medications from “African” shops (equivalent of a western-style chemist) . It is not always the diviner who is responsible for the prescribing these toxins, but rather the patients who buy medicines without completely understanding their content.